Read more on their english blog.. If anyone asked Mr. Idle himself, he would not invest a cent in this venture. Mr. Idle doesn´t really like copycats. Wow, what a great deal! Our friends from CrossLoop.com in California raised six million Dollar in their second round of financing. Peer 2 Peer seems to work. Especially in PC support. Their concept definitely makes sense to help each other across the web instead of paying expensive PC specialists "off-line". Congratulations from Beef Island, yammer.com! Congratulations to the TechCrunch50 winner Yammer.com! Of course Mr. Idle would dig out some bucks to invest in yammer.com if anyone asked him. This is a real great venture with a pretty smart business model. As president of CouchTycoon and frequent twitter user Mr. Idle sees the big advantages of a "corporate twitter". Again, congrats to West Hollywood! Giving away products can be a logistical pain. For instance, when we give away a T-shirt or laptop, we have to go through hundreds of comments, contact the person, and do a lot of manual processing. A new Y Combinator startup called ContestMachine that just launched makes giving stuff away as easy as putting a widget on your blog. You create a contest widget by entering all the details of the giveaway: prizes, deadlines, rules. Winners can be randomly chosen by ContestMachine or judged by the blogger. It automates the process of creating giveaways, and opens up contests to any blogger or small business who has a Website. The service is free to try out for up to two contests a month, and then charges $9 a month or $90 a year for more contests. Of course Mr. Idle loves contestmachine and he would like to invest in this venture too! Have you finally realized your lifelong dream of opening up a restaurant? Are you having trouble spreading the word on its existence? If you are, then you should take a closer look at Letseat.at. Through this site, you’ll be able to create a website for your restaurant, bar, or café. The process is much like creating a blog. All you need to do is choose a theme, add all relevant information about your restaurant, and share it with the rest of us. For instance, you might put up your restaurant’s menu, allowing possible patrons to know how much they will spend and what food they can expect from your diner. One very interesting feature is the fact that you can create printable coupons through the site. This will let you advertise your site online, and get more and more people to know about it by accessing your site for savings. If you still haven’t created a site for your restaurant, go do it now at Letseat.at. Wouldn’t it be cool if you could see where people are sending Twitter messages from? 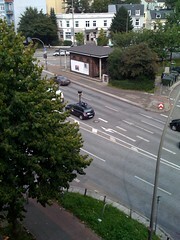 That’s exactly what you can do with Iphonetwitters.com. This site lets you see where people who are using their iPhone to send messages to Twitter are sending them from. This adds a whole new level of interaction to the somewhat boring concept of Twitter. For instance, if someone is having drinks with friends, they’ll be able to put it up on Twitter and you’ll be able to see where they are exactly. You can then join them and have fun. This mashup is brand new, but as more and more people buy iPhones and hear of this site, it’ll be interesting to see how many are using Apple’s phone to Twit. For now, it’s just a novelty service that will keep you entertained. You should try to find some of your friends to check if they’re Twitter posts are true or if they are lying about where they are. Mr. Idle, virtual president of CouchTycoon, and the team on behalf of Mr. Idle, BlueHorseshoe (co-founder) and Couchinator (co-founder) couldn´t believe it, when we saw the first referrers from our entry at CrunchBase! 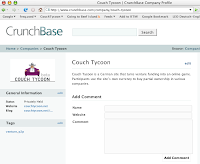 Now CouchTycoon is an "official start-up". Thanks CrunchBase-team! The new CouchTycoon venture "addnr.com" is seeking money! addnr. is (as they say) the first application that allows people to save off-line items to their bookmars. Just call a phone number and the item will be saved to your bookmarks at addnr.com. This phone call is FREE because [Edna] won´t answer the call. Try it! If you like [Edna], help her and invest! Buy a share of addnr.com - probably the next google acquisition!? It is with deep regret that we inform our users, friends and fans that we will be shutting down the AllPeers service today. We are tremendously proud of the product that our team has built, and we remain convinced of the potential of adding social features like file sharing to the web browser. However, we have not achieved the kind of growth in our user base that our investors were expecting, and as a result we are not able to continue operating the service." Simkl Blog » About: "For those who don’t know about us - until April 2007 our team has been developing a web portal A.UA which has an audience of One Million users every month (currently 983`359 people for the last 30 days to be precise). And we decided that it was time to expand and show the world our new ideas. So now for the last 6 month we were developing a brand new website and web services for our global audience. We believe that Internet has just started to become what it should be - simple, well designed, contain information about everything, accessible on any computer and any device and be a personal helper in everyday life and business. That is how a new simkl.com website was born, cause Simkl - is always simple!" 1000MIKES: a German start-up in "closed alpha" as they say..."Live-Berichte hören oder selber machen. Bücher kaufen und verkaufen - Direkt an deiner Uni! - Bookya: "Bei Bookya können Studierende lokal, direkt an der Uni, Bücher untereinander kaufen verkaufen sowie neue Bücher portofrei bestellen." here a screenshot of our old style;) just if you miss it! Mr. Idle´s latest find is "go4funding" as they are advertising on killerstartups.com. And so he thought this could be another competitor of CouchTycoon. But after a short view on their website he´s repacified! Go4Funding.com is a platform to bring entrepreneurs, business owners and investors (angel investors and venture capitalists) closer together. The site is strictly intended for existing business owners and entrepreneurs to post their capital needs. Investors can browse through various investment opportunities as well. just one more ad-financed bullsh..
YouNoodle.com - competitor or friend of couchtycoon? "YouNoodle helps people and groups that are interested in startups and innovation do what they do better. We provide business competition, event, networking and mailing list functionality for real-world groups that support startup communities. For investors, we're building technology to help inform their decisions." Today Mr. Idle is glad to be able to open CouchTycoon to more beta-testers! After six weeks of hard work, now CouchTycoon 0.2 is ready to be used. Mr. Idle allows a few more beta-testers now to check the site. Now CouchTycoons are able to submit their own ventures and to promote them in a completely new design. Please let him know what you are missing and what you like! Good luck with your micro investments on the "CouchTycoon P2P Venture Market"!